Coco made me do it. Guilty as charged. Do what? I don’t know either. LOL! 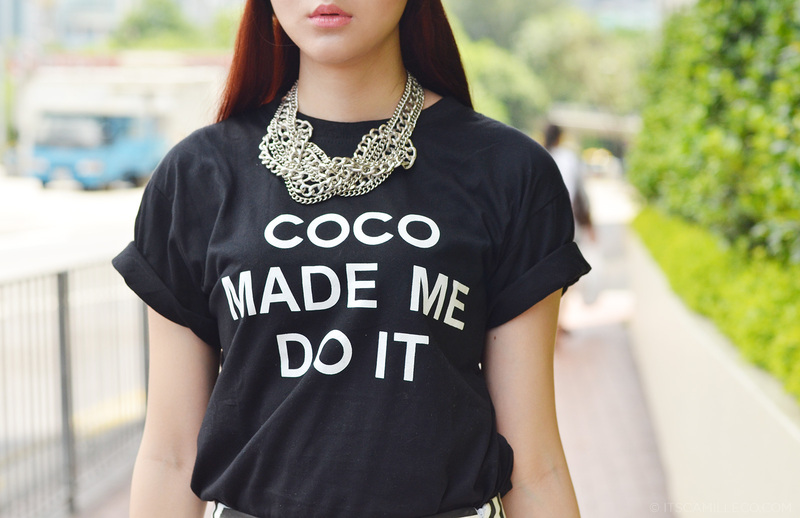 I just thought, being a fan of Coco Chanel, this shirt looked pretty cool. How awesome is it to be such a fashion icon that with just your first name, everyone instantly knows who you are. I wonder if these people knew they’d become legends. I think Coco Chanel knew because she’s just awesome like that. Too awesome! Anyway, enough about my gushing over Coco. (Yes, we’re on first name basis. We have the same initials after all. LOL! Talagang naghanap ng connection!) I wore this outfit during my daytrip to Hong Kong for some shopping and dining. Being a shopaholic with a purpose, you can just imagine how my mom and I rushed all over the city with just 5 hours to shop. Actually, make that 3 since we ate so much at the restaurant it took us 2 hours to eat! What can I say, we love to shop but we love to eat as well! This is my brat pose. I was really feeling my shirt’s statement, wasn’t I? Whoaa! Ang galeng. Day trip to HK for shopping? Makapag-ipon nga ng milyon for that. I love your hat and your shirt. How do you do it? Making a simple t-shirt look amazing? May formula ba diyan? Haha! OA naman! :) Walang formula! LOL! The shirt is just too cool! Hi Miss Camille, may I know what kind of oly lens did you use in your photos? They are gorgeous! Lumix 25mm f1.4 lens I think :) Thank you! These were taken using Nikon though! Awww sweet niyo! Thanks Maebs! I love everything about this outfit! From head to toe! OMG it’s PERFECT! Haha! Your style is sooooo versatile. You really know how to play with clothes.. AND THAT’S WHAT I LIKE ABOUT YOU! STAY GORGEOUS! Great to see you show your love for one of the world’s most famous fashion names, Miss Camille! Had a blast looking through this post; what with your clothes combination and very sassy poses, you stole the scene! I like how loose your top is. You took the norm of “slimming-black” and turned it into a breezy-casual look made edgy by your chunky chain necklace. I love how you don’t always conform to color stereotypes! The look is balanced with the vertical stripes of your shorts. I also admire your choice of length for this particular piece since it looks very comfortable- short enough to show off your long legs and long enough to make a standout statement. Your hat and your shoes make you look put-together since the fabric of the hat is snuggly and your shoes are shiny leather. The buckles remind me of old-school Mary Janes. :-D The bag is a great match to your metallics. It’s awesome to have a mom who share the same interest as you. Haha! Yes it is! Thanks Diva In Me! Ms. CC, am a big fan of yours. You are totally fabulous! Akala ko noong una, si Coco Martin.. hehe!! For my birthday today, I will wear something awesome and then when somebody asks me, sasabihin ko, “Camille made me do it!” hahaha! I like the sound of that! :) Thank you Reena! a ball gown or the mermaid gown? Aww thanks Elle! :) I wore a ball gown during mine. I think it’s because you can’t always wear ball gowns. Your debut is the perfect place to wear one and to feel like a princess. Mermaid gowns look more mature kasi plus you can still always wear mermaid gowns to other occasions. Naks! :) Camille Prats?! LOL! Thank you Sephie! Hi ate camille!! I love your shoes! parang i’m not familiar with the brand pull & bear. did you order that online or what? Love the tee, it’s hilarious! I’d wear a shirt with your name on it! That’d be awesome too! ;) you’re awesome! Thanks Jaszy! :) So sweet! It is really CC :) Coco Chanel and Camille Co! Love this statement shirt, I should have this one! Those shoes are exactly what I’ve been looking for for ages! Hi po :) pretty! How did you make your blog? Using blogspot or WordPress or what? Pls. Reply. Thanks so much po. Love! This outfit reminds me so much of Andy Torres’ style of Stylescrapbook! Especially the shoes! Something I’m sure she would also wear! Pansin ko lang, you don’t seem to stretch the shoulder straps of your Balenciagas… I wanna see you carry them like a messenger’s bag paminsan! haha! Pakialamera much? Kung sa bagay paminsan kasi pag masyadong mahaba din yung shoulder straps…ang tendency mas malayo sya sayo kaya ako, I always get conscious pag masyadong mahaba yung straps kasi feeling ko, nadudukutan na ako without me knowing it unlike pag mas maikli yung straps, mas malapit sya sa katawan mo kaya mas mararamdaman mo if ever may pickpocket haha! Do you feel the same din ba sometimes? Praning lang din kasi siguro ako kasi I always hear stories from my friends na nadudukutan sila or sina-slash yung purse nila. I doubt naman you commute kaya less prone ka sa ganun. Pero kahit when roaming around lang in public places like malls, praning pa rin ako with the shoulder straps of my bags haha! Kaya di rin ako fan ng backpacks eh. Mas convenient nga pero di mo alam nadudukutan ka na pala sa likod. haha! The shoes are very classy with the buckle details. You rock it like Coco!!! Hi camille! I am one of your followers whom you inspire with your fashion. Aminado naman akong im one of those “baduy/trying hard” pumorma. That’s why i prefer wearing simple/basic clothes instead. But now, i am so inspired by how you dress. So perfect! Im one of the boys and so concious wearing something revealing. Hope to hear more of “how to mix and match and finding the right style for you” piece. Keep up your blogs and keep inspiring people.thank you! Awwww thank you AC! :) Only my mom, sister and I would wear it siguro! LOL! I would wear it too! That’s for sure!